Hey guys, I finally get a camera to post some shots of my '77 Malibu project. I picked up some parts recently and i'm trying to get it back together. 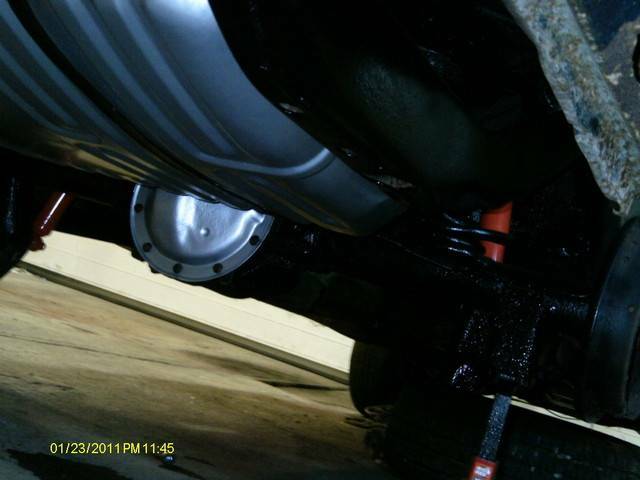 New ball joints, tie rod ends, control arm bushings, shocks, wheel bearings and seals. Backstory: I bought this car on August 15th, 2007. It sat for exactly a year when I put it on the road on August 15th, 2008. It was the first car I had on the road and it was my daily driver until May 2010 when it left me stranded at a gas station. I decided that day that a few changes were in store. Trash the low-go, 150kmi 305 in favor for a 350 with a four barrel. 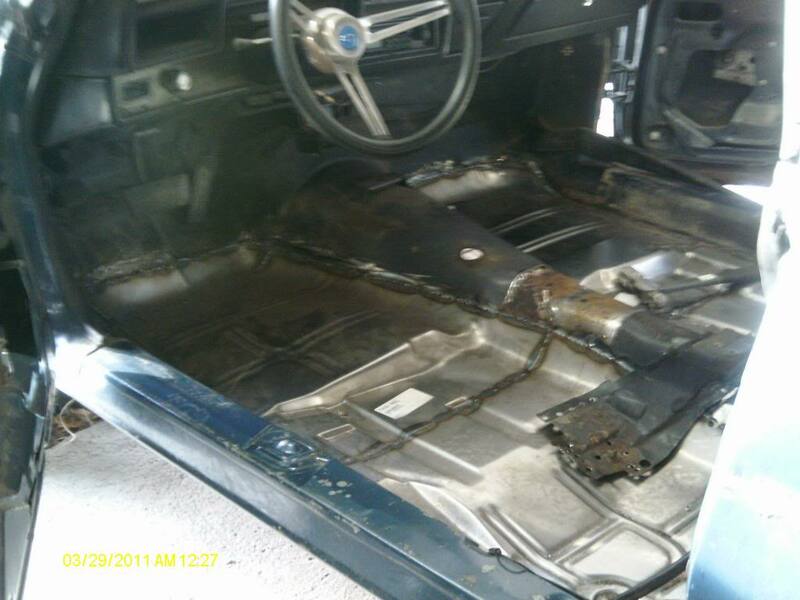 Get rid of the slush box, I have a Saginaw 4-spd going in it. That and rebuild the sloppy front end. 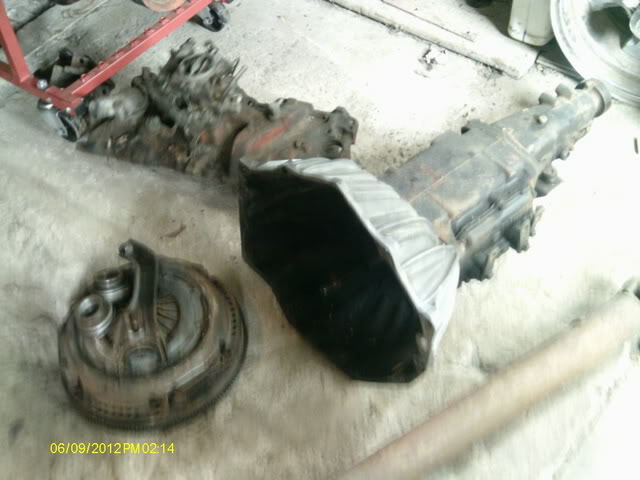 I've had the motor together and ready to go since June 2009, just waiting for its new home. There's more to come, can't wait to drive this thing again. Trying to dig up some cash for the 4spd parts and the exhaust. I picked up a pair or 285/15's and they fill up that giant wheel well quite nicely. Nice job! Gotta love the Rochester 4V....vroom, vroom! Went a little overboard on the wiper motor. 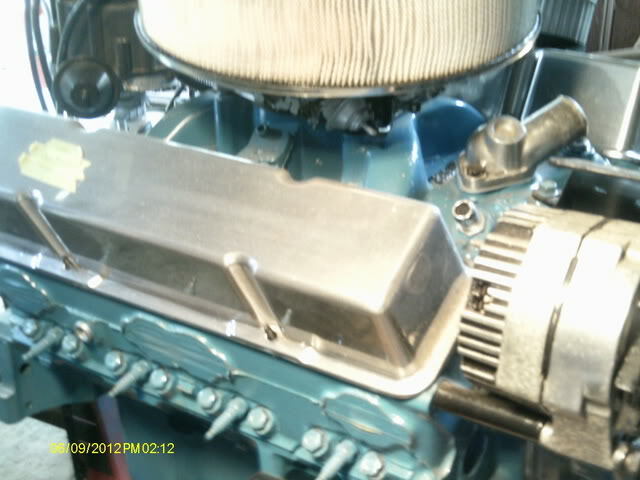 Here's another motor shot. I have to redo the alternator, the clearcoat spider cracked on me. I'm going to wet sand it out again, polish it - again and then spray it with clear. Might even change those grooves to blue instead of black. 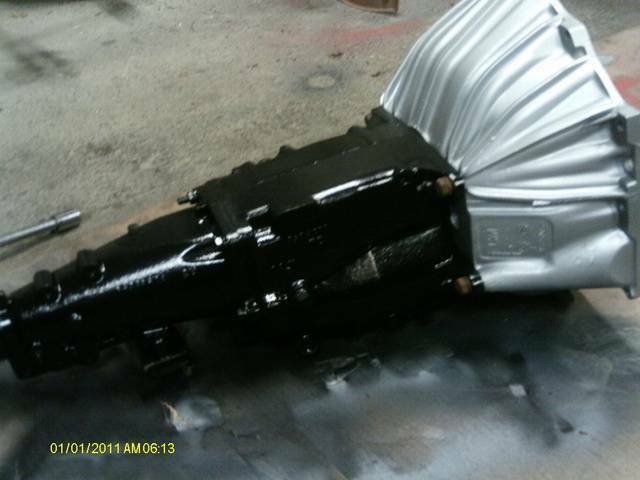 Gotta paint up the transmission and that's ready to go! Well, I have a little progress. I got the front suspension back together far enough to get the car to my other shop where I have better power and a concrete floor. It's back on its feet! 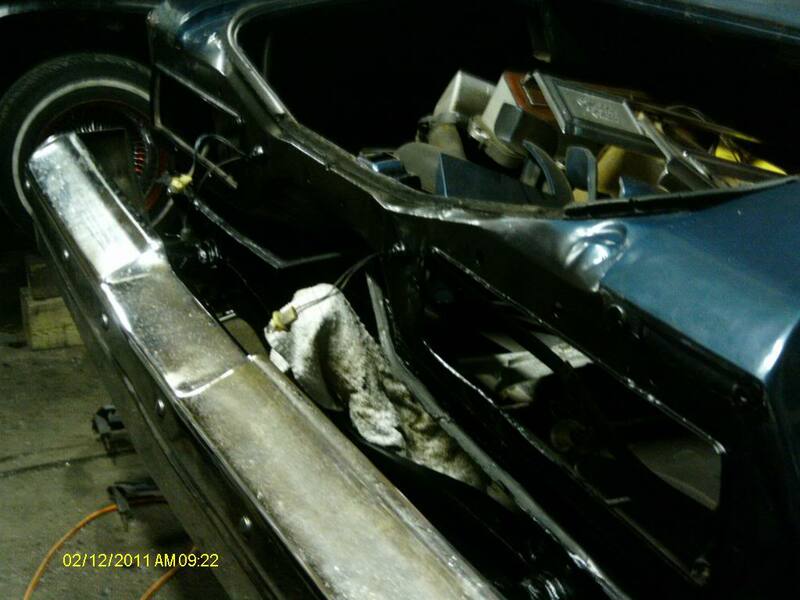 I have to do the front floorpans, some fool riveted in sheetmetal and then bondo-ed around the edges. I figured now is a good time to do it before I get the engine and trans back in the car. 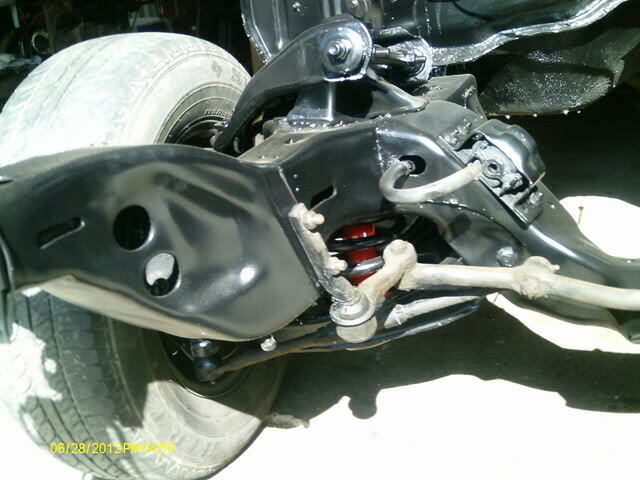 Plus I wanted to put some attention toward some other aspects of the car - the undercarriage. I pulled the tank out yesterday and much to my surprise... it leaks. I went to dump out the two gallons of two year old gas and it came out of both sides! So there's a setback of about $200 . 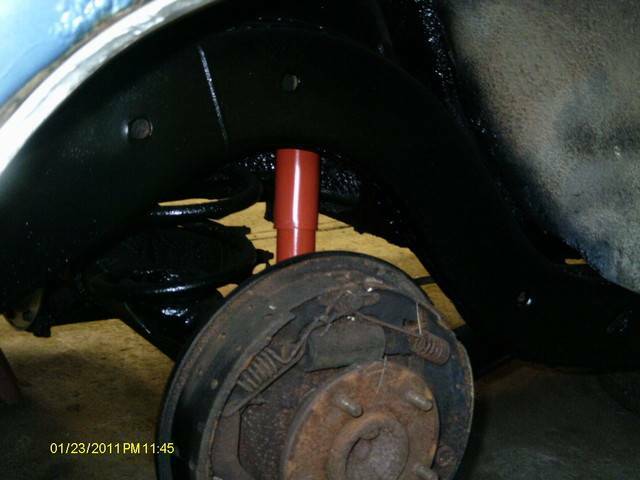 Still have to paint the center link and tie rods, slapped it together to get it to my shop. Damn, I can't wait to see carpet again. 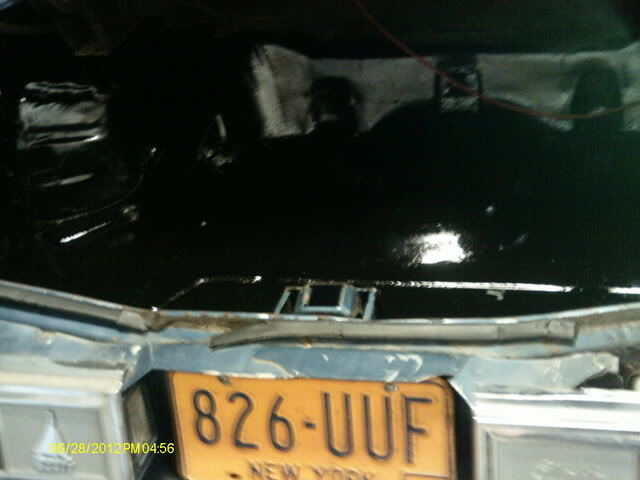 Coating the trunk floor before thats the next bit of sheetmetal I have to replace. The next area to get attention. I'm going to clean up and paint everything from the front pans back. Need to save some cash for the floorpans. The shocks are goners too, they'll get changed. I might as well do the lines, replace the wheel cylinders, rear shoes and drums while I'm at this point. Rust!! 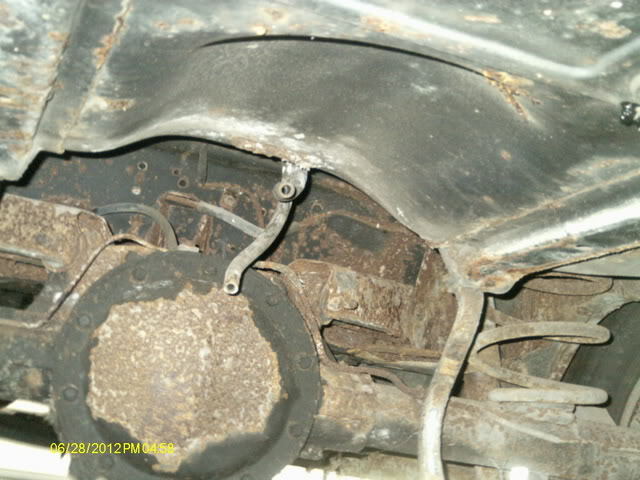 This is the worst rot on the car, unfortunately the quarters arent cheap nor easy to replace. Maybe this winter when I have some down time I'll tackle this. The LH side isn't that bad and will mostly be salvagable. Welp, here goes, there's no turning back now! 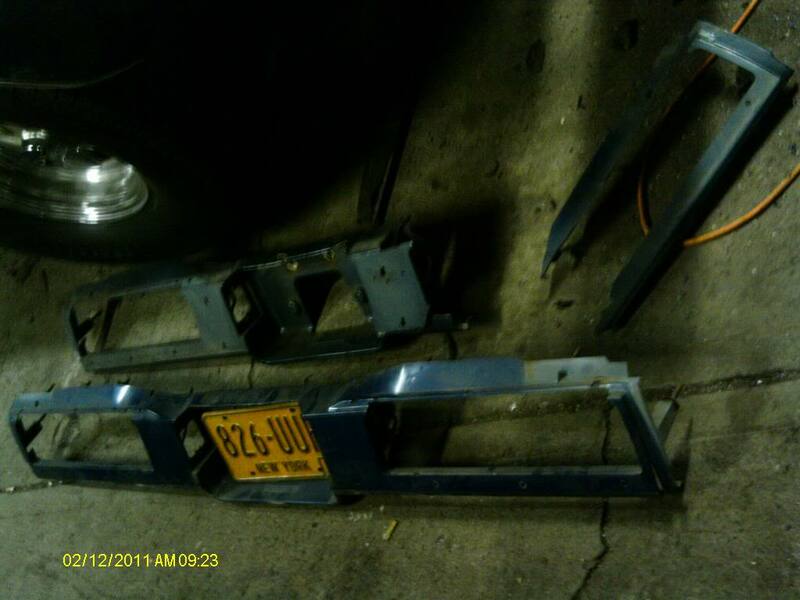 Neat that you have the old NY plate on there. Im going to put a set on one of mine too! Car looks like it progressing nicely ! lookin good. i kinda had a thing for those old alliance wheels 20 years ago...they look at home on there. Thanks. Yeah I have tons of plates, all the way back to 1915! Lot's of 40's-50's plates. I stuck them on there for pictures haha. I like the Alliance wheels, the only problem is I only have a pair. I was thinking about keepin' the Rallys, I just need to get a pair of 15x8 Rallys for those giant tires. Did you buy that car in Hudson or near there? I seem to remember a while ago getting on to the Taconic parkway and there was one for sale,same color, near the Taghanik Diner,right in front of the diner actually. ant7377 wrote: Did you buy that car in Hudson or near there? I seem to remember a while ago getting on to the Taconic parkway and there was one for sale,same color, near the Taghanik Diner,right in front of the diner actually. Yep, right in front of the diner. That's the car! I bought it August 15th, 2007. Wow that's cool, someone on here saw it before I even bought it! I spotted it one saturday afternoon on the way home from the Catskill's . Im glad to see it is getting restored. Nice to see a car get resurrected. Hey everyone, long time no update! Unfortunately our part time mechanic fell ill in September so I've been working 6-7 days a week 10-12+ hrs a day. Plus keeping up with my small engine repair shop and the classics my friend constantly drops off doesn't leave much time for anything else. Well, he's back to work and it's been pretty slow at my shop so it's been crunch time. I've finished up the rear part of the chassis so far. New fuel tank, new shocks, new rear diff gasket and fresh gear oil. 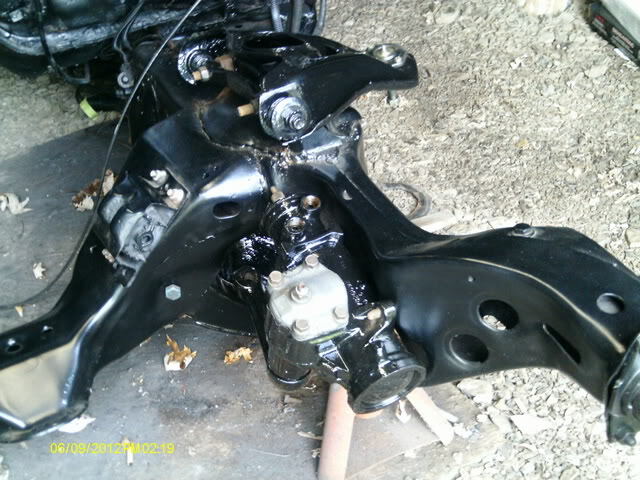 I also painted the bellhousing and Saginaw 4-speed while I was at it. 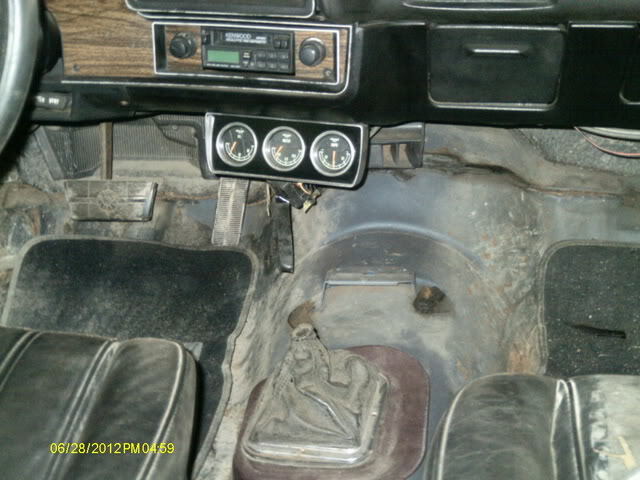 I removed and resealed the shift cover while I was at it. Then I got into the next nightmare. 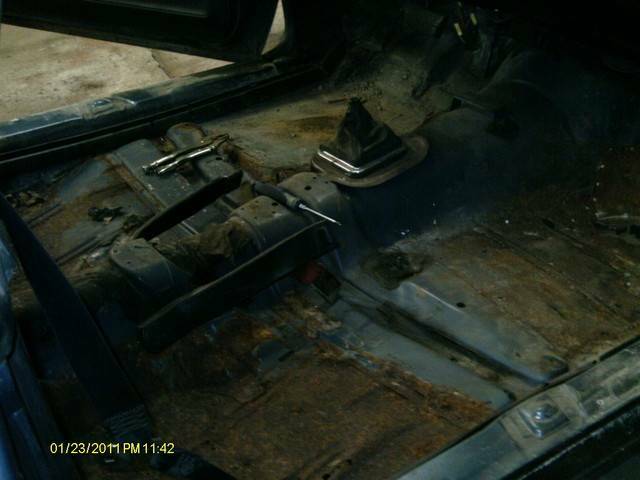 I started ripping the interior apart with the intention of replacing the front floor pans. 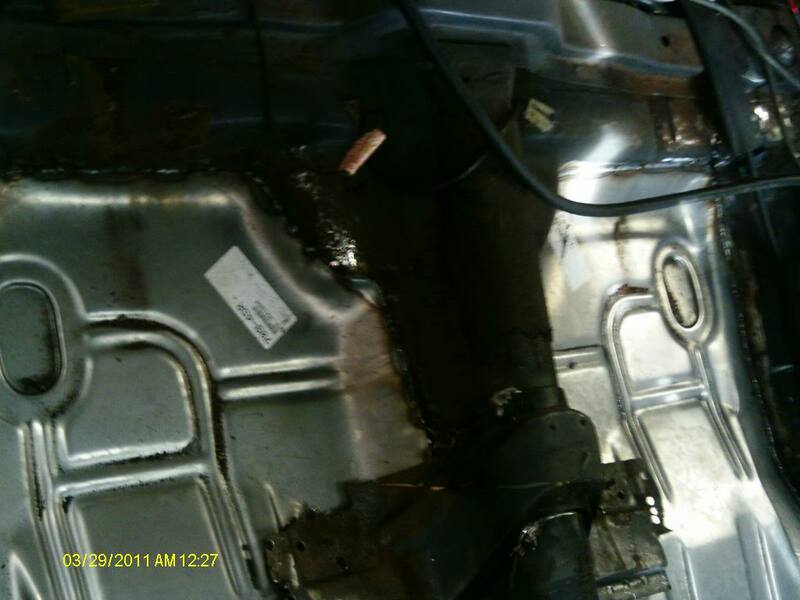 Unfortunately I found more than I had bargained for... gotta do the rear pans too! Ugh. Theres an extra $200. Oh well, when I pulled the back seat I found $4.78 in change so I guess thats a start, right? I'll have the rear brakes in soon, the floors are going to take some work and i'll probably use my tax return to buy the pans. I have my '64 Mercury Marauder up for sale, but no bites yet. I guess I have to get back to my shop duties for now though, I have a '71 Suburban coming in for a thermostat and brakes and after that a '64 Impala that needs a trans and runs like crap. 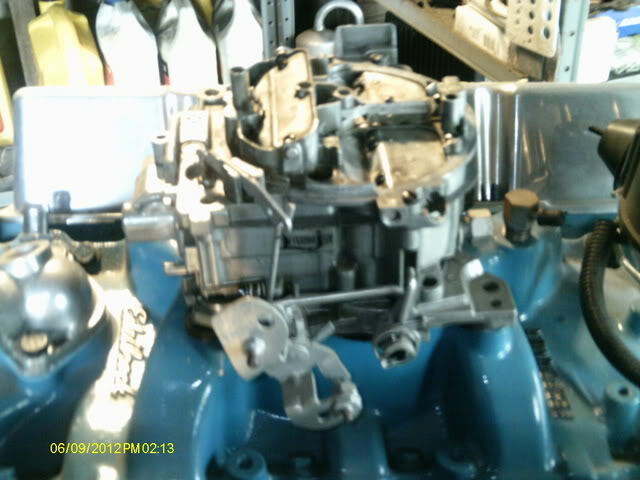 I've gotten a couple of calls for small engine work last week too... good things don't last forever! Hopefully I can get on here more often and catch up on what I've missed! I did buy myself a nice Christmas present though, brand new Hobart 220 Mig welder so I can handle all my welding needs in house. Can't wait to put it to work! Thanks! All except for the swiss-cheese floor boards! Meh....That's pretty common. Hows the trunk pans? The trunk is solid as can be. If you look at the pics up top, I already cleaned it, brushed it with POR-15 and then undercoated it and topped it off with semi-gloss. I've done the same thing with the rear of the undercarriage. Hadn't started on undercoating the floor pan area because I knew i'd be replacing them. I hadn't planned replacing the rear sections until I pulled the carpet. But now it has to be done because i'm at that point, I was already in deeper than I originally wanted to go. I'm in it for the long haul now I guess. At least you know your backglass doesn't leak. Check the windshield though I used a cup of water & discovered the water was getting in from there in various spots. Opera windows leaked as well, especially on the same side. Salt does a job too from underneath of course. Great progress! Looks like it will be a fun ride! 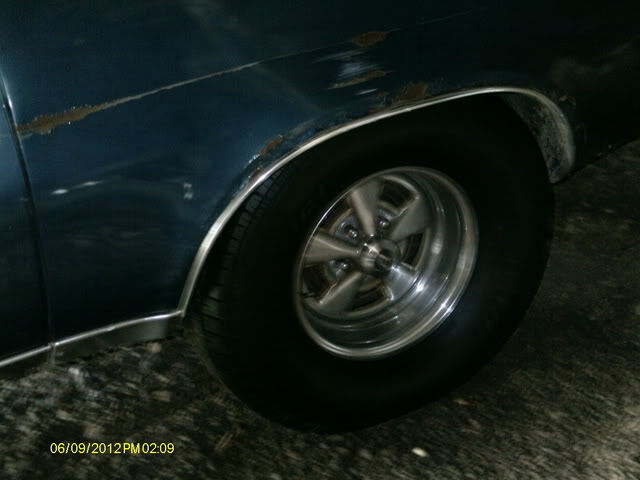 I have to ask why on the 4 spd saginaw? I am only asking because I have went thru a lot of them in my 69 Camaro over the years. They really can't handle much abuse, take it from someone who has crunched MORE than my share. ( 8 and counting, plus 3 -3spds and two muncie M-21's.) You will be OK if you don't powershift or have too much torque behind it though. I am running a super T-10 now from a 1979 Trans Am and that's the way to go if you can get one. 77mali- Yeah, I know that the windshield leaks on the drivers side on the top. It has a little rot and is starting to push the trim out. I might replace the windshield while i'm at it, it's pretty pitted. I have a little rust starting around the rear window in the usual spot, bottom corners. I should be able to pull the trim and clean it up. Pontichev327- The Saginaw is from my old '80 El Camino factory 4spd. 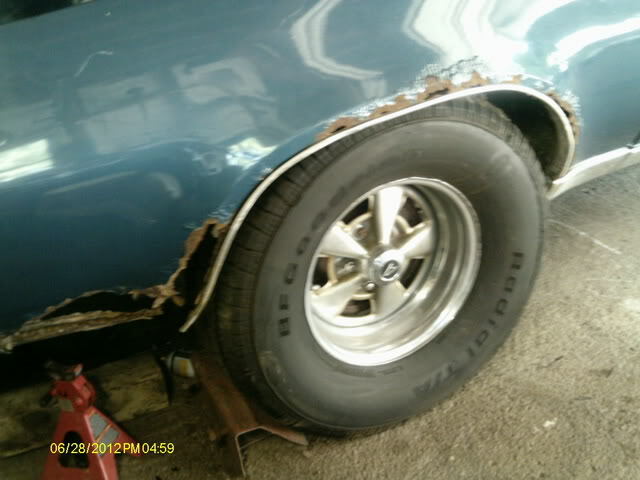 It was rebuilt not too long before I decided to trash the car due to major rot issues and parted it out. I ran the piss out of it in the El Camino and never had any trouble. Trust me, that El Camino with a warmed up 350 and no weight in the rear was a handfull. I had two Turbo 350's - both were smoked. 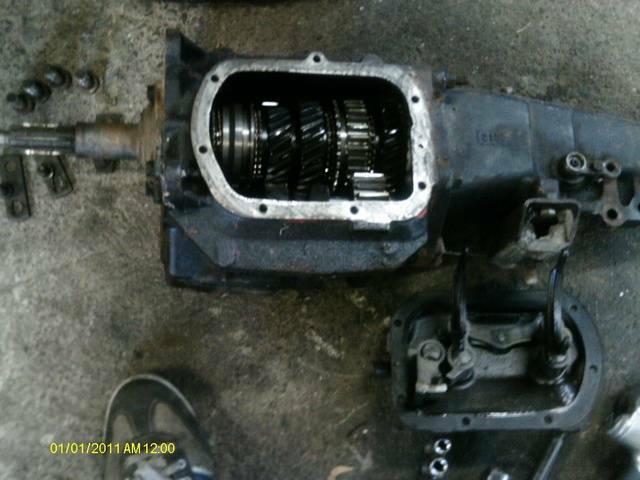 Then on the other hand I had a good 4spd ready to go. They didn't build 4spd cars in '77 so I decided it was the unique thing to do. I don't have a ton of cash laying around to put something more stout in it, so I'm sticking with the Saginaw until I destroy it. DiscoMalibu wrote: 77mali- Yeah, I know that the windshield leaks on the drivers side on the top. It has a little rot and is starting to push the trim out. I might replace the windshield while i'm at it, it's pretty pitted. 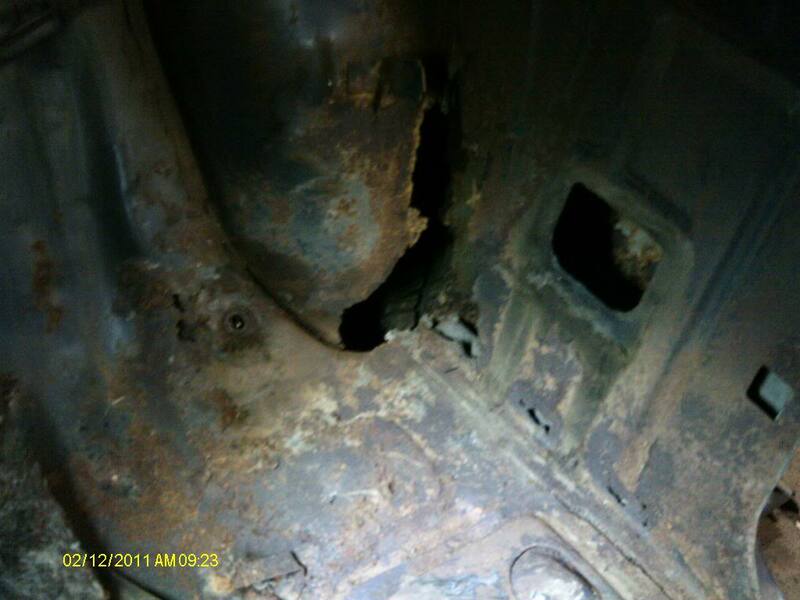 I have a little rust starting around the rear window in the usual spot, bottom corners. I should be able to pull the trim and clean it up. If it's small stuff like what I encountered, I used "JB Stick epoxy putty" over Por15. The biggest prob I had was a dime sized hole on the lower part of the RH back-glass channel where they had the panel joint. Worked good. I hope my windshield channel is as good but judging from the rust on the interior firewall areas probably not. I'll might replace the front glass as well unless I can buff it back to life but it has a few chips. Well its been a little while but I've been making some progress. 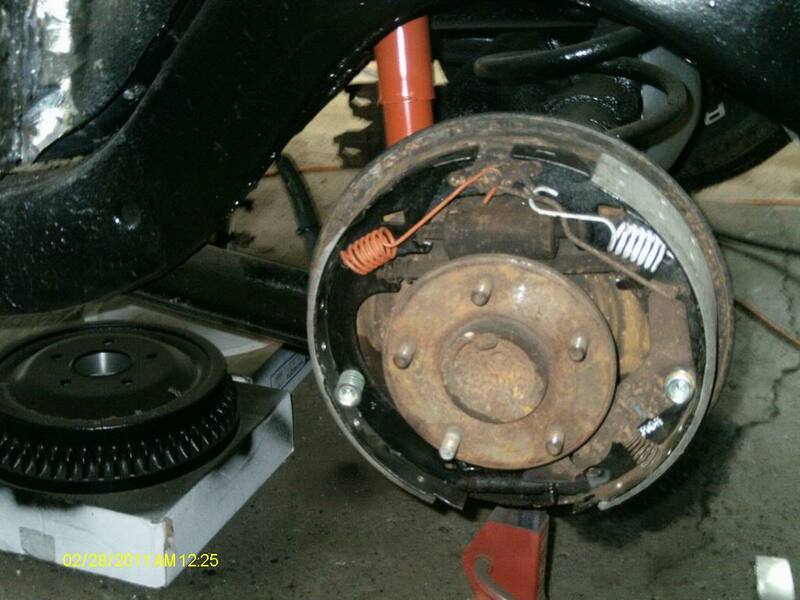 I installed new rear brakes and drums. 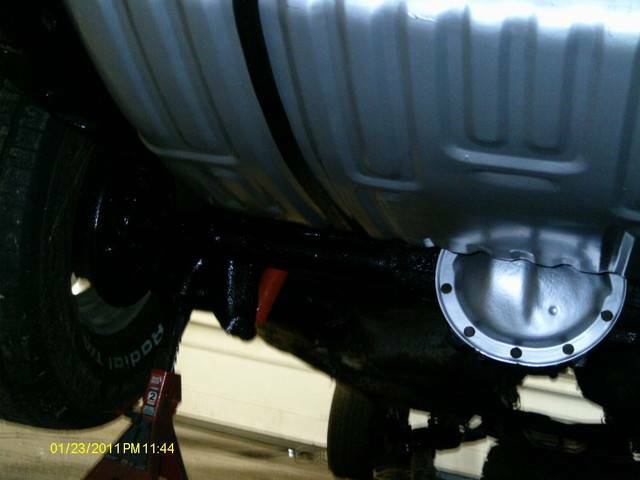 Did some patching on the inside LH rear and in the wheel well. 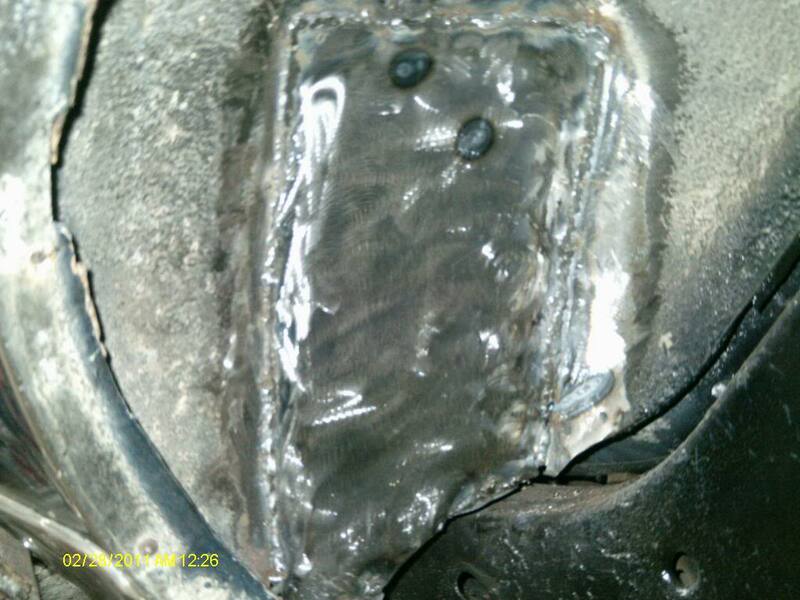 Fixed a spot in the LH section of the seat pan. 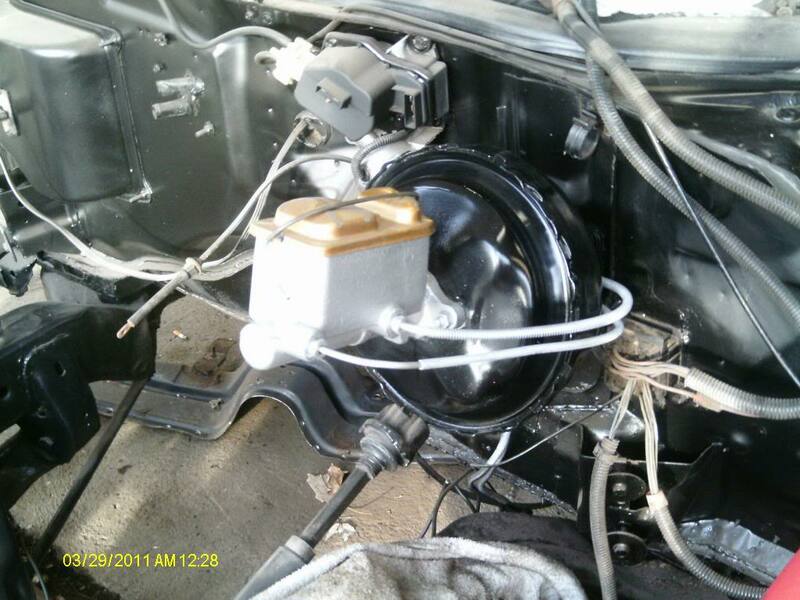 I painted and installed a new master cylinder/booster, finished hooking up the lines and now it has brakes again! A few days ago my floor pans arrived from Motor City High Performance and I was quite pleased with the quality of the pans. This weekend I had some spare time and they're already in! I removed the floor braces (pain in the arse!) and cut the old pans out. 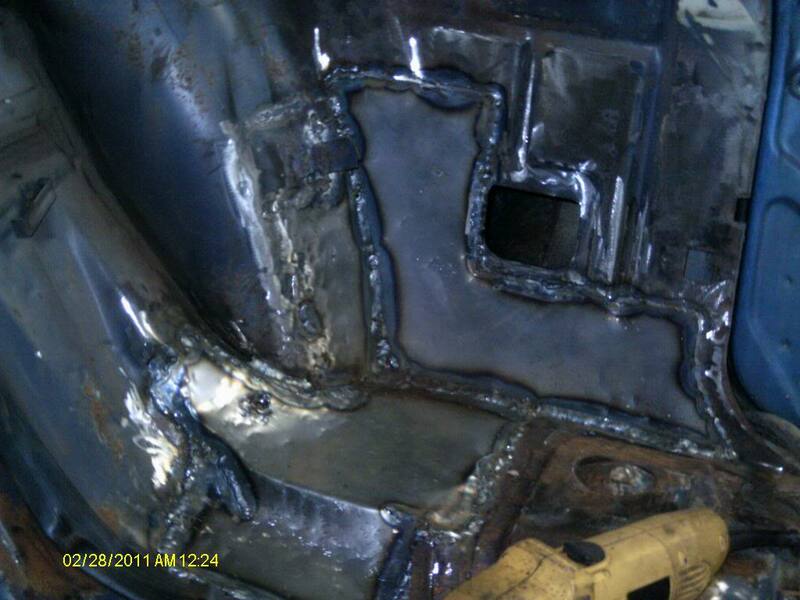 The drivers side is all welded up just have to finish the passenger side. Then I can put the floor braces back in and make sure the seat mounts line up. I still have to get the shift hump and I might as well grab some new carpet while I'm at this stage. Just have to paint the floor and seam seal a few spots and thats that! I'm going to pick up the motor from my other shop this week. This thing is going to be going back together pretty quick! More pics soon, happy bangin'. Welp, heres some of what I've accomplished thus far. 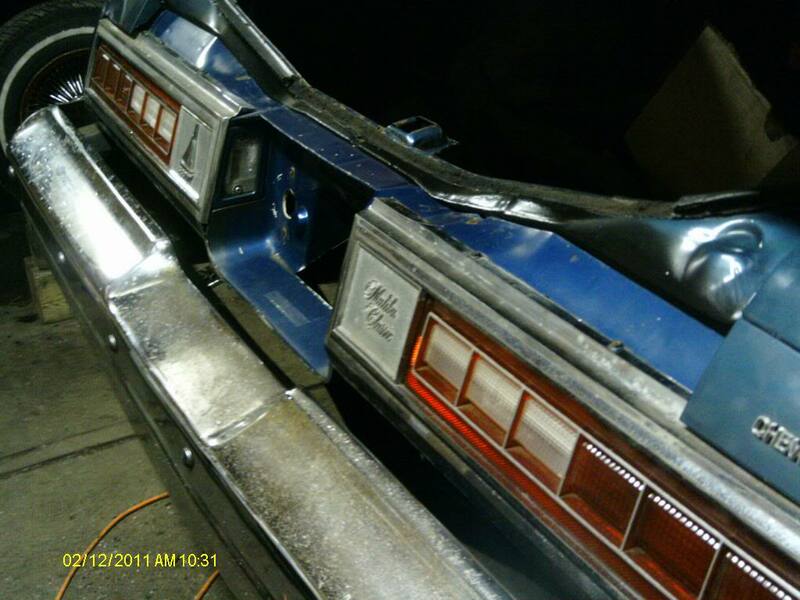 I removed the old broken tail panel and replaced it with a straight one off of a '76 I found in the junkyard. Cleaned up the rust and painted the rear. I moved on to repair the LH rear inner wheel housing area. Quite a bit of rot there. I made up some patch panels and welded everything up. 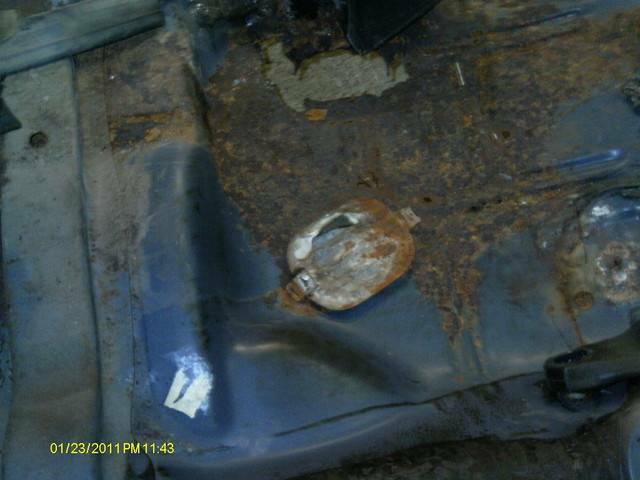 I patched the rear seat pan while I was at it. I removed the vent for the quarter inside of the door jamb and sprayed it. I then replaced the rear brakes, drums and installed new E-brake cables. The E-brake never worked for as long as I've owned the car but with the 4-Speed its a must. Now the floors are in! The worst is almost over, gotta put the floor braces back in and make sure the seat mounts line up and then I have to get the shift hump and put that on. 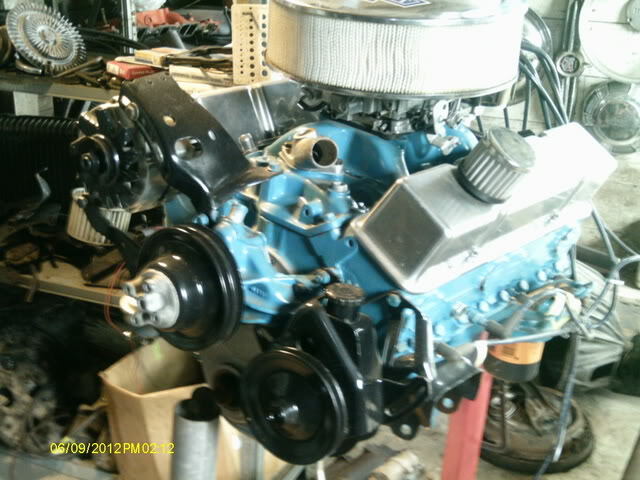 I have to go underneath and tack some things in and paint then I can put the motor back where it belongs. 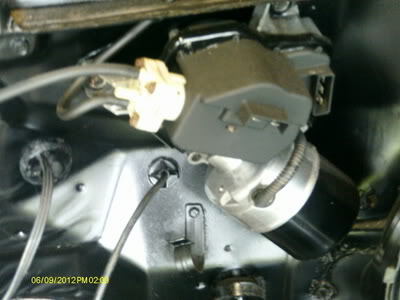 I also picked up a rebuilt master cylinder/booster, painted it, bench bled it and installed the lines. Now it has brakes once again! Thats all for now, still have so much work left to do. The floor is the main thing, it's been holding me up for a long time. 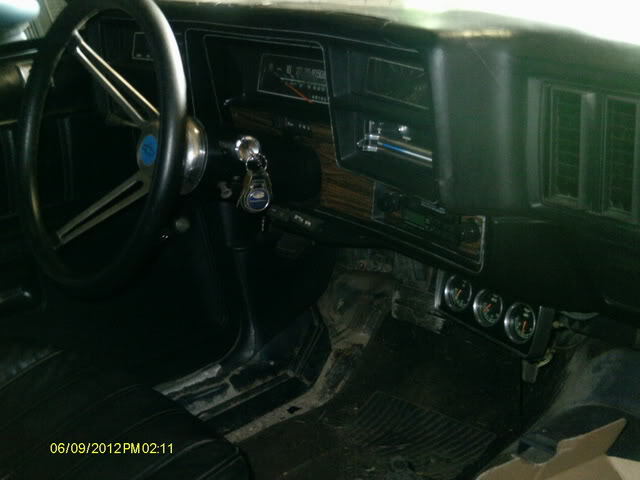 Now that thats almost done i'm in the home stretch and hopefully i'll be driving it around this summer. NICE! Those pans look sweet. Of course! New metal always looks sweet... thats what $420 can get you. Ha! That's cheap- Imagine if you had to pay someone to do that? $420 + Labor & Markup on the parts.